With tea increasing in popularity, you may have heard about loose tea, which is also called loose leaf tea. This is what you would see at Teavana or Davids Tea. It has been increasing in popularity over the last few years, and you should expect to see even more sellers appear. This article gives a brief overview of loose tea. Loose tea is actually the full tea leaves with their essential oils left intact. They are dried and used for steeping in hot water. This is opposed to tea bags which normally contain leaf fragments and tea dust. According to an ancient legend, a Chinese emperor named Shen Nung was enjoying some boiled water when a leaf accidentally flew into his cup. As he allowed the leaf to remain in the cup, it turned his water light brown and gave it a refreshing taste. Since then, tea has been enjoyed all around the world. Whether this is true or not, it is believed that tea did originate in China. What are the benefits over bagged tea? Loose teas are said to have more flavor, more health benefits, stay fresh longer and are more affordable (depending on where you buy from). There is also a much wider selection of teas and flavors, which can be mixed with other teas. Where can I buy loose teas? You can buy loose tea from numerous online tea stores, health related supermarkets like Whole Foods, natural health stores, and retail tea sellers. How do I make or brew loose tea? There are a number of ways to brew loose leaf tea. Some of the ways to brew it include (1) heating the leaves in an infuser, strainer or filter, (2) heating the tea leaves directly in water then using a filter afterwards to separate the leaves, (3) buying an electric teamaker that automatically handles the brewing for you, or (4) getting even fancier and using a cast iron tea pot, which has its own steps. This is a common misconception, but if you buy and brew your tea correctly, you end up saving money over the bagged versions. 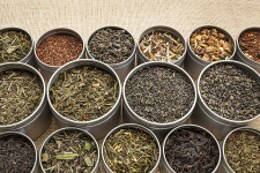 One main reason is many loose leaf teas can be re-steeped, which cuts down on the cost. There are loose leaf teas that will cost more, but sometimes you pay for what you buy. Loose leaves can be loaded with antioxidants that are normally not in bagged tea. Do loose leaves come in bags? This is starting to become more popular as certain brands are placing loose leaves in tea bags, so you get the convenience of the bag plus the health benefits of the loose tea. Pyramid tea bags have been introduced which allow loose tea to expand and breath much better than traditional tea bags. I still have read mixed reviews over whether they really compare to loose tea being brewed itself. How long to brew loose leaf teas? Each type of tea has its own perfect brewing temperature and time. Usually directions are listed on the packaging telling you the best way to brew it. You do not want to brew the tea too long or it will become too bitter. There is room for experimentation depending on how strong you like your tea. While loose leaf tea was very popular in colonial times in the U.S., it was only until recently that the public has learned of its greater benefits compared to bagged tea. Expect to find more fellow tea drinkers in the future.